Kelly crafted this massive countertop from salvaged old-growth redwood. When a furniture-maker has as much artistic talent as Kelly Maxwell, you’d naturally assume he’s been working with wood all his life, starting as a hobby when he was a boy and then honing his craft through his teens and into adulthood. But you’d be mistaken. “I grew up farming most of my life. Then I became a paramedic. Woodworking didn’t come until much later. At first, I couldn’t cut a straight line or pound a nail straight. It’s something I learned as I went along,” he says. “Much later” came when his daughter was about to get married, and his wife asked if he could build some furniture for the ceremony. 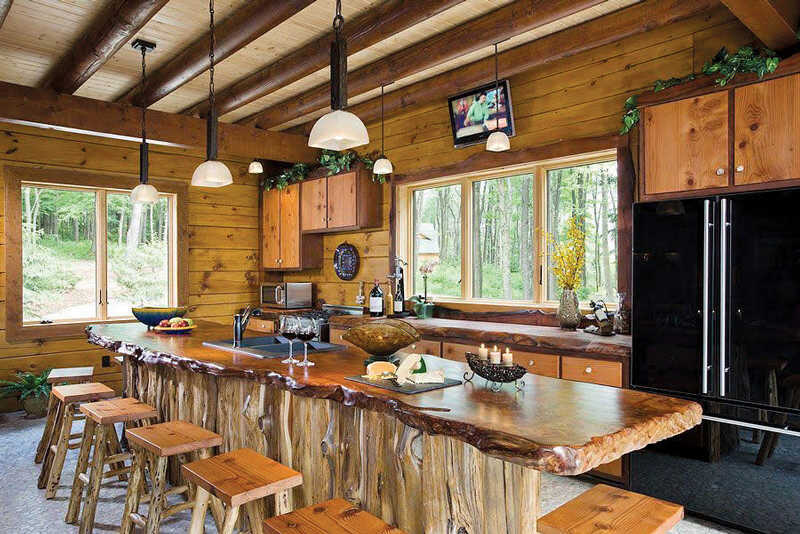 To look at his masterfully built beds, vanities, dining tables and countertops now, you’d never know he was 100-percent self-taught. 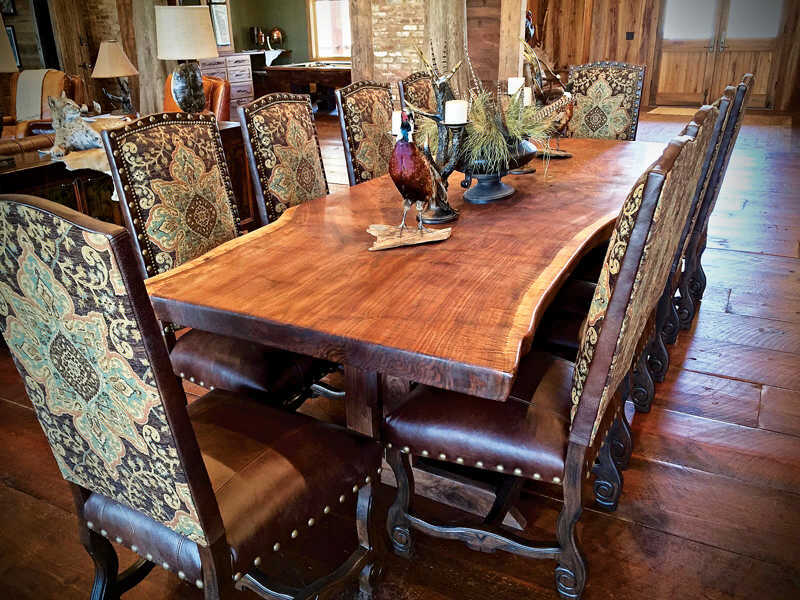 Extensive sanding and natural tung-oil give Kelly’s pieces their luster. 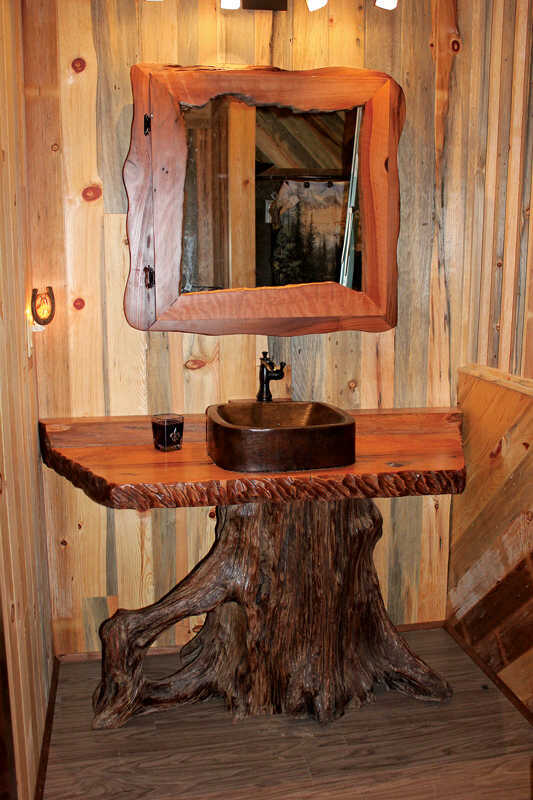 A hollowed-out tree root makes a one-of-a-kind vanity pedestal. Though walnut and redwood may be his species of choice now, the first bed he ever made was from standing-dead dogwood. Kelly’s studio, Littlebranch Farm, in downtown Nashville, Tennessee, boasts 11,000 square of space that includes a 3,000-square-foot showroom, with the rest dedicated to his workshop and warehouse — more than enough space to house the massive pieces of raw material he’s known for. Kelly’s process is simple and straightforward. Take creating a bed, for example: “First I choose all the components that will give the bed symmetry. I don’t want it to be heavy on side and light on the other. I want to bring balance to it as much as possible while keeping it natural. Say it’s going to be a juniper and redwood bed, I’ll pick out the headboard posts and based on what the posts are, then I’ll select my center slab that will give me the height that I want, then I choose the footboard. Sometimes the footboard makes a strong statement, but usually it’s a fade-away so that the focus stays on the headboard,” he says. 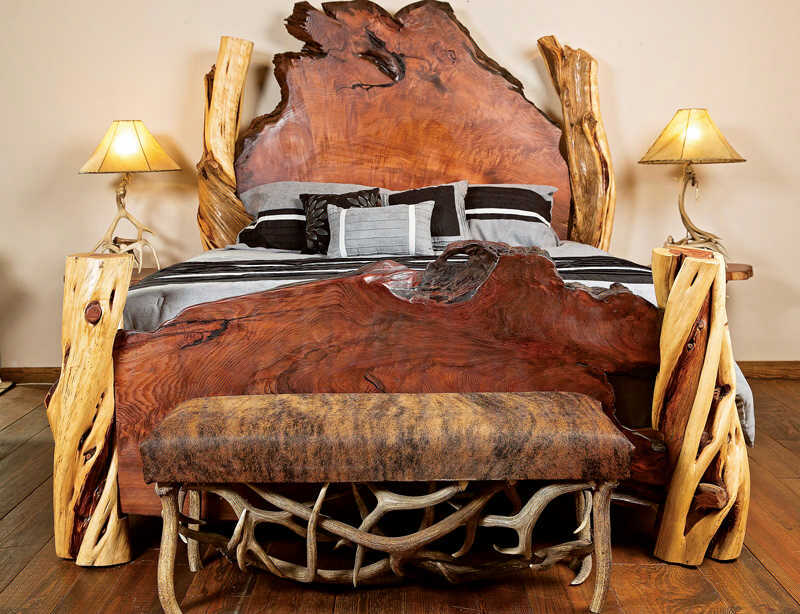 Twisted juniper and redwood slabs comprise this rustic-yet-elegant bed. Kelly never stains his furniture. The colors you see are the exquisite tones of the wood that he brings to life through his finishing techniques. “In my shop, we do a lot of sanding. I’ll take my wood surfaces down to an extremely fine sandpaper —anywhere from 400-1600 grit. It takes a lot of time, but it’s worth it,” he states. This meticulous process is what gives Kelly’s pieces their satiny-smooth texture and rich, natural color. To properly commission a piece, there are a few things Kelly needs to know, starting with the size of the space where it will be placed. And for all his many talents, serving his clients just might be what Kelly does best. Go with someone who’s been building furniture for a living for a long time, not a crafty weekend warrior or an arborist who cuts down trees. You want a craftsman. Commissioning custom furniture is a little like building a log home. You need to develop a relationship with the artist and you definitely want good communication. Is it a sprayed-on finish that’s sitting on top of the piece or is it pulling the luster out from the wood itself? Ask how long the wood has been cut and dried, and how. If it’s been kiln dried, what type of kiln was used? If it was a vacuum or dehumidifier kiln, the wood has likely lost a lot of its character. Or was the wood dried long and slow, either in an enclosed warehouse or naturally in the forest? For wood to air-dry appropriately, it takes about one year per inch of thickness. Select your materials (and spend your money) wisely. For example, on a dining room table, people often ask for a large, fancy root system as the pedestal. But between the chairs and the nature of its use, that root base isn’t very visible — and it’s expensive. So you’d end up paying a whole lot for something you’d rarely see. Make sure you are getting something that’s appropriate for your space — not too big or too small. And pay attention to color variations. Each type of wood has its own unique color tone. A true artist will help you pin down exactly what you are looking for in a specific piece.